해인사를 두고 있는 가야산은 높이가 해발 1,430m이며, 우뚝하고 기이한 모습으로 우리나라 8경 가운데 하나로 꼽히는 신령스러운 산이다. 이곳의 돌과 물, 붉은 소나무숲은 다른 절이나 명산에서도 보기 힘든 자연경관을 갖고 있다. 해인사는 가야산의 서남쪽 기슭에 있는 절로, 신라 애장왕 3년(802)에 당나라에서 유학하고 돌아온 순응과 이정, 두 대사가 세웠다고 한다. 조선 숙종 때부터 고종 때까지 2백여 년간 7차례나 불이 나서 건물 대부분이 타버렸고, 지금의 건물들은 대부분 조선시대 후기에 세운 것들이다. 현재 절 안에는 고려 고종 23년(1236)에서 1251년까지 15년간에 걸쳐 완성된 호국안민의 염원이 담긴 고려대장경판(국보 제32호)이 있다. 그 밖에 장경판전(국보 제52호), 반야사원경왕사비(보물 제128호), 석조여래입상(보물 제264호), 원당암다층석탑 및 석등(보물 제518호), 합천 치인리마애불입상(보물 제222호)이 있다. 뛰어난 가야산의 자연경관과 역사의 숨소리가 살아 있는 해인사 지역의 문화유산이 어우러져 있는 곳이다. 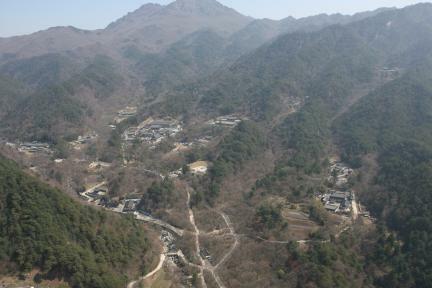 Haeinsa Temple, situated at the southwest foot of Gayasan Mountain (1,430m), is said to have been founded by two great Buddhist priests, Suneung and Ijeong upon their return home from a period of study in Tang China in 802 (or the 2nd year of the reign of King Aejang of Silla). The mountain itself is revered as one of the top eight scenic spots in the country due to its grotesque-looking rocks, clean running streams, and red pine forest, the like of which is rarely seen elsewhere in Korea. During the 200-year period spanning the reigns of Kings Sukjong and Gojong of Joseon, fire broke out at the temple on seven occasions, so most of the buildings that can be seen today were rebuilt in the later Joseon Dynasty. The temple is particularly famous for housing the Tripitaka Koreana, a collection of Tripitaka, or Buddhist scriptures, carved onto roughly 80,000 wooden printing blocks. Designated as National Treasure No.32, the Tripitaka Koreana was made to pray for the safety of the country and the happiness of the people, and took fifteen years to complete from 1236 (or the 23rd year of the reign of King Gojong of Goryeo). The temple’s other heritages include the Janggyeongpanjeon Depositories, in which the Tripitaka Koreana are carefully preserved (National Treasure No.52), the Stele for Royal Preceptor Wongyeong from the Banyasa Temple Site (Treasure No.128), the Stone Standing Buddha (Treasure No.264), the Multi-story Stone Pagoda and Stone Lantern (Treasure No.518), and the Rock-carved Standing Buddha in Chiin-ri, Hapcheon (Treasure No.222).The beautiful sight of Gayasan Mountain and the valuable heritages kept at Haeinsa Temple make the place a favorite destination of visitors from all over Korea and beyond .